Gynostemma - Natural dermocosmetics and dietary supplements. Collagen creams. Gynostemma, also known as jiaogulan, was successfully used in Chinese medicine. It was even called the "immortality herb". Thanks to its properties it is often compared to other valued herb - ginseng. There are no other substances apart from gynostemma in the capsule - no additives or preservatives. Because a simple composition precisely eliminates a problem and a precise answer to your needs. Gynostemma helps maintain physiological pH balance of stomach. Product ingredients: Gynostemma extract (Gynostemma pentaphyllum), gelatine. 1. Who should use Gynostemma? 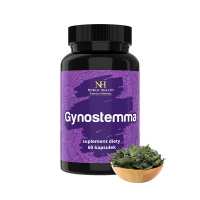 Gynostemma is recommended for people who want to maintain acid-base balance of stomach. 2. What is the composition of Gynostemma? Gynostemma belongs to the Basic line, therefore it has a simple composition - it contains no additives such as fillers. 3. What are the properties of Gynostemma? 4. How to use Gynostemma? Take 2 capsules a day, wash them down with a glass of water. Do not exceed the recommended daily intake. Food supplements cannot be used as a substitute for a varied diet. A balanced diet and a healthy lifestyle are essential for maintaining good health. The recommended daily intake provides beneficial health results. 5. How to store Gynostemma? Store the product in a dry place at room temperature. Keep away from small children. 6. How many capsules are there in one bottle? 7. What is the net weight of Gynostemma? Net weight of the product is 19.74 g.